If there was one satisfying part of the wake, it was breaking the news to Jon Rogers that his secret plans for more trees on Bristol's streets were recorded -and seeing the despair on his face without him noticing the camera was out again! He was devastated. After Bigotgate, after Twittergate, now this, Treegate, could be what decides the vote in Bristol. One of Cameron's minders tries to warn him that he's probably said enough, but he ignores her, looks me in the eye and says: "I'm a friend of the motorist. Why wouldn't I be? Like I said, I'm a motorist myself." What's more, he's not embarrassed by the fact that he is good friends with an unapologetic, politically incorrect petrolhead named Jeremy Clarkson. It's not my job to suggest which way you might vote next Thursday. But of all the would-be or serving prime ministers (including Margaret Thatcher, John Major and Blair) I've interviewed over three decades, I can honestly say I've never met one as pro-motorist as David Cameron. We also like Cameron's proposal of a fair use tax on foreign lorries, though it fails to include extending the tax to cyclists, or pedestrians, with that big slice of the road "The pavement" which is denied us except in Montpelier, Southville and bits of Fishponds. Even then, it lacks the formal painting of parking bays the way Waltham Forest has. Maybe a tax on bicycles and pedestrians was the secret "hard decisions" he was being so vague about on TV last night. We hope so. That and the thought of John Redwood being a position of power and appearing on TV to tell off the single mothers for having their husbands leave them and the poor people off for not being born into wealthy families made us so tingly we had to nip off to that special Stokes Croft massage parlour where for an extra fee they wear fox-hunting clothes as they beat you. That would really spoil it for us drivers: a fast alternative to the M1/M6 where non-drivers can drink their lattes as they check their emails on their laptops. Have you ever tried to do the M5/M6/M74 run while writing a set of powerpoint slides and steering with the knees while texting ahead your schedule? The laptop batteries never last past Lancashire and you have to pull off at Chernobyl-B services to charge them up again. A high speed train link would give the tax dodgers an edge, and that would never do. After the funeral, the cyclists meandered down to King Street, which has plenty short-stay parking for our vans, and a large area of teh street -our street- wasted on bicycles. 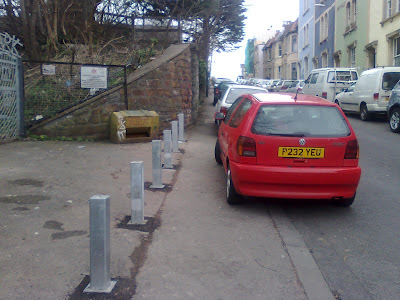 If they are to have bike parking, it should be on pavements, preferably ones not used by cars to park. As it was, not only today did the cycle park fill up, some of the BCyC troublemakers ended up chaining four or five bicycles up on the other side of the road -again, our road and not the pavement. This is insensitive to the needs of other road users. Chris's children: Chris Jr and Alice turned up with Chris Jr riding Chris's own bicycle. He also brought extra biscuits in the classic "bag on handlebar" luggage style. For some reason the cycle press is scared to come out and acknowledge the effectiveness of supermarket bags from handlebars. We not only think it works -we believe if the supermarkets made carrier bags out of more visible and reflective material than the classic Sainsbury's orange, it would improve cyclist safety, especially those of students. Chris's bike ended up in the room itself, which may have seemed a bit odd to some, but it was very apt for Chris. Generally, Chris Hutt and his bright pink bike were rarely separated, so bringing it in as a memento was appropriate. This, then, was Chris's last bicycle ride. Here are many of his fellow travellers. the Martins from the BCyC, Sarah of the Save the Railway Path campaign; Cecilia, Terry M and one of the Steves from that group were also present, among the many others -and those look like Sustrans people loitering to the left of the frame. At the traffic lights, we can see Eric, ex-ByC and now involved in Cycle City work, Rob Gallagher, and various other people none of who have registration numbers for us to complain about -especially Terry Miller, who is standing on the pavement with his bicycle. Here's the final approach to the crematorium. Notice how little hi-viz clothing was to be seen, and how they didn't get out the way of our van, despite its obvious importance. Do they not realise how dangerous it is to cycle next to a van whose driver is filming while driving? Here we can see Jon Rogers; he also gave an excellent tribute, one which mentioned his disappointment with Chris awarding him the second place in the Bristol Traffic anti-bicycle awards. He hasn't yet discovered we caught his secret tree plans on camera yet, something that he was only told of later on in the day. Finally, the coffin is unloaded and taken in to the crematorium, leaving Kevin and Sylvie to take the empty vehicle away and stand guard over it. We believe that these peoplehave plans to make the September Bristol Cycle Festival more interesting -and are even behind a planned meeting on that topic, which obviously concerns us. Were he to link up with Quercus, whom we saw later on descending from St Michael's Hill with some of those critical mass people on funny bicycles, we fear for the city. No coverage of the event inside, except to say it was pretty hard for a lot of people there -and there were a lot of people there. Furthermore, nobody seemed to have picked up on the fact that the cover photo of Chris shows him cycling the wrong way up a one way street! One of our team members participated in the funeral procession. The cycle hearse was supplied by Cap'n Bikebeard, a festival bike that was decorated for the event by Chris Hutt Junior. The hearse was actually encountered on the approach to the funeral directors, with it and the support vehicle, they brought westbury to their knees. Indeed, it was very hard to take these photographs from a motor vehicle while handling a phone call and sounding the horn, especially as more cyclists kept joining the route. By the time we were in Westbury on Trym proper, the roundabout was taken over by these troublemakers. Out in the roundabout, artist and writer, Dru Marland. On the left, with purple jacket: John Grimshaw of Sustrans -who gave a very moving tribute. At the head of the procession, Chris Junior is on the front left of the hearse, Cap'n Bikebeard behind in the back row. Chris senior gets to take a rest on his last bike journey. Behind the hearse, Steve K of the cycling campaign and the CTC, with some of the CTC people in their roadie clothes. Before anyone points out that by participating in this event we must be part of some kind of vast cycling conspiracy, we will point them to this video. As you can see, bringing up the tail of the parade is a large white van: us. Such a vehicle actually benefits the cyclists as it ensures that nobody aggressive would try and overtake them, so we hope our contribution was appreciated. It is rare -indeed this is a precedent- that we did not try overtaking them, but then the sheer number of them made it tricky. More coverage in parts two and three. For those people who haven't seen yesterday's shocking video yet, Cllr Jon Rogers was caught promising to increase the number of trees walking round the city by 100% within 12 months. Well, if the council is letting these tax-dodging tree people out into our city, we should at least find out a way to keep them out of our way. One of our reporters drove up to the Highbury Vaults to interview one of the tree festival people to try and understand why they don't stay on the pavement. The goal was to identify common problems, such as bicycles and old people trying to use zebra crossings. We think there may be enough commonality here to start working together. If we can convince them to drop the entourage, the pedestrians, the bicycles, and go for hi-viz, it may be possible to co-exist and fight the real problem in the city, which is the street furniture and bollards forcing cars and trees off the pavements. We both need more parking! Give us back our pavements! Bristol Graffiti has been quiet recently, so we have to help out on Muller Road, which has multiple vote conservative posters up on it's Shaldon Road advert area. It's clearly not targeted at the locals, who are happy to not only rip off bits of the advert, but write up things on top about giving the saved money to bankers. And they walk there to do it! This advert is targeted -like the ones at the bearpit- and the motorist stuck on the way to the M32, held up by an anti-car council that refuses to make Muller Road a dual carriageway, refuses to remove the pedestrian crossings further up the road which create all these tailbacks. This party knows their audience: the British Motorist, though it doesn't quite get the message right. Rather than "Let's cut benefit for those who won't work", it should be "let's raise taxes for those who don't drive". That would be better. The Chinese government -communists- subsidise petrol, yet here in the UK we won't even sell it at cost. It's enough to make you vote for the Communist Party of the People's Republic of China, though even in the Bristol West postcodes that got Bristol East ballot papers, these people aren't listed as an option. But that is not the real issue of today's post. Today's is about a shocking political gaffe by a senior city politician. We aren't going to spell out what he says -you need to listen to what he says. And what he doesn't. He is coming out and showing us which side he and his party is on when it comes down to the greatest issue in the city this week. This exclusive video shows exactly what enemies we, the out-of-Bristol motor commuter face on our daily drive in, with the M32 traffic jams and the struggle to find a parking space afterwards. We are the victims of these inner-city bigots! More shocking footage of how dangerous these urban trees are! Here on Redland Grove, the tree has at least got out of the way of cars. But look how out of control it is! It nearly knocks over a small child, and narrowly misses the camera crew! This is worse then as driving an HGV in a Burkha -believe us, it makes pulling out a lot trickier until you give up looking round. Whoever is in charge of this tree is quite clearly drunk. Look at this! This is one of our road-tax financed streets, one with a nice bit of short stay yellow lines outside the Somerfields supermarket for a quick beer & tobacco purchase run, yet the car driver who has just done that cannot reverse out, as there is a tree and the entourage in the way! They are there, taking up the whole road, camouflaged. No hi-viz, no helmets, no single file. Or insurance, registration, MOTs. If the car had reversed into them, you know who would have got the blame, don't you? The driver. And if the EU automatic-blame-the-driver legislation gets imposed on us here then you can be sure that these tree people will be jumping in front of cars just to claim insurance off us! Tambourines and violins are not a substitute for body armour and lane discipline. 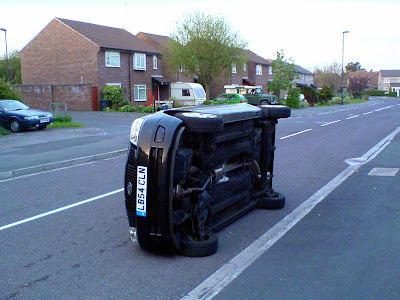 It may be normal in Somerset to pootle round like a tree, but this is a big city now, and there needs to be signs on the A38, A370 and other approaches saying "trees dismount". Or laws requiring them to sport the appropriate safety gear, travel single file and pull over when a tax paying car needs to get past. This week we are reminding everyone that the annual critical-mass prance round the city takes place on Saturday May 1, as people dance and hop their way from the Arnolfini to Horfield Common by way of a large number of pubs, including, here, the Highbury Vaults. Now, we too like a couple of pints before getting the roads too, but find that drink-driving laws prevent us having more than four pints before heading out, and even then you have to hope the police don't pick on you. Yet here we can see -in another example of anti-car bias- that it's OK to bounce up St Michael's hill so stocious(*) that you think dressing up as a tree is a good idea, yet we car drivers are not only prosecuted for being less drunk than that, we even get held up by these tree people. And their families! They bring out their children! And walk them down the road! This is unacceptable. A strong government would ban this kind of thing, not just re-instate foxhunting, but let us hunt people that dress up like vegetables. We plan more coverage of this problem, unique to Bristol, in the coming week. Including, exclusive, shocking, scandalous video coverage of the council's secret support for this so called "alternative transport"! (*) Stocious: to be very heavily drunk. A Scottish word (there are lots of words for drunk in Scotland, more fine-grained than elsewhere). Even the Eskimos with their alcoholism issues don't fine-grain the details quite as much, but then they have the snow to talk about. (*) Update. The original article said Saturday May 3 -Saturday is in fact May 1. The trouble with a nice spring Sunday is the Sunday cyclists come out -with their kids attached. Unlike commuters, who know their place: the bottom, these militant parents have unrealistic beliefs. First up Cotham Road, 14:15 on a Sunday Afternoon - GN56FJA is forced to aggressively overtake a bike which shouldn't be in the way. It's not too dangerous, the oncoming golf doesn't even flash their lights -and they have given the bicycle lots of room. They even waited until the top of the hill had been cleared, so there was enough visibility to see the oncoming golf before pulling out. You wouldn't see such courtesy in London. A short while later, probably 14:25, the tax dodging family are walking their bike across a zebra crossing on Pembroke Road. We love Pembroke Road -a fast alternative to Whiteladies Road, not a single light, speed camera, bus lane light or other feature to interfere with the sprint from Clifton to the Downs, apart from two Zebra crossings at the bottom. The woman driving RV10OBG -the first 2010 car in our database-, just had a different interpretation of the rules from the cyclist. Yes, a car is required to give way to a pedestrian waiting to cross or on a zebra crossing -but what if there is an island? Once a traffic island appears, you can ignore the other lane, so they aren't on your bit of the zebra crossing. And as they aren't waiting to cross the zebra crossing -they are on it- that rule doesn't apply either. Finally, at about 14:30, you can see why we really hate these people, when RO57WFG gets abuse from the parent purely because it turns straight over them while turning from Clifton Park to Clifton Down Road. The parent and child were probably turning left, so there was no need to slow down or indicate -and this VW Touran was clearly in a hurry -because the man driving didn't indicate at the miniroundabout either. But he achieved his goal: got to the bridge first, where unlike the tax dodging family, the driver paid for the upkeep and the illumination of the bridge. This shows that one single cyclist can, in the space of fifteen minutes, nearly cause three collisions. You can also hear a small child in the background asking questions about why the deranged parent is shouting registration numbers at the car. What kind of example is that? He will grow up to be one of those people who get banned from supermarkets for shouting at people. Signage changes in Dove Street now show which area is reserved for Wino parking, and which for Gnomes. While unawares of the Stoke's Croft gnome problem, it is nice to see that those fond of nipping down to the area for a quick beverage now have somewhere convenient to park. We should also draw everyone's attention to the Hare on the Hill pub, just above where the previous photograph was taken. It is a Bath Ales pub, and when combined with the Hillgrove, a few doors along, can make for a fine evening out. We also hear a rumour -just a rumour, that there is a local cider being brewed near here -"Ninetree cider"- from locally grown apples. More investigation is needed. The politicians are stealing our pavements! We had looked forward to seeing one of the party leaders doing their set piece "one of the people riding on a bike" shots, so that we could accidentally clip them in our vehicle. Indeed, we drove around all morning looking for such a scene, but presumably their minders had recognised that the only people who ride bicycles in this city look and smell funny and it doesn't help win votes in the rest of the city, let alone the country. Eventually the passengers in the back of the bus started demanding that they actually get to Fishponds, so we had to return to our scheduled route. Also you have to be careful when you go off-route in a double decker, as low bridges can catch you out. 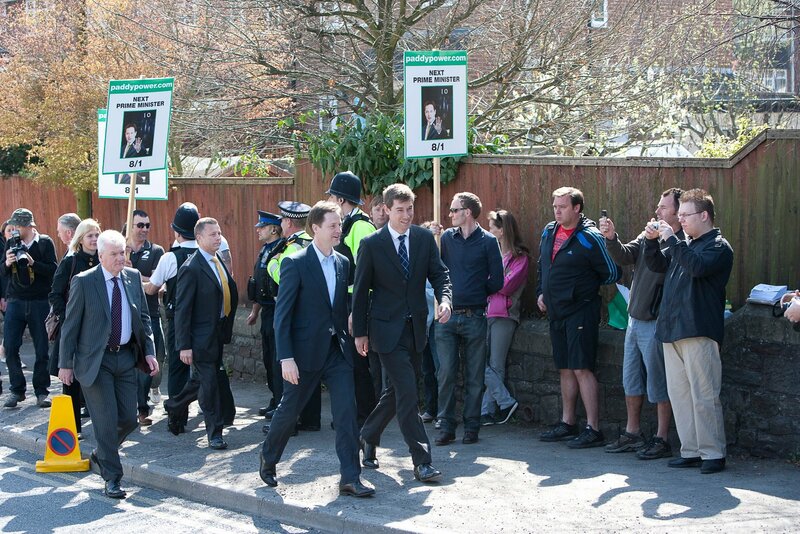 We are grateful, however, for this photo send to us by Andrew Stagg, who was part of the press entourage. 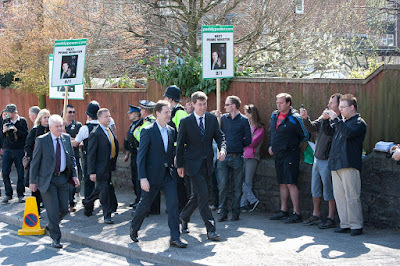 It shows Nick Clegg, out for a walk in Westbury on Trym to meet people holding up mobile phones or banners protesting about something or other. Think about it. A walk? Who walks in this city? Unless it is someone going from the school-keep-clear zone in their 4x4 to the school gate, or someone in the B&Q car park picking up a jet hose for driveway cleaning, the only people walking are the very elderly, children and students. The elderly are going to vote for whoever the Daily Mail tells them to, children can't vote, while students, on account of the fact they don't pay any tax yet, shouldn't be allowed to walk on the pavement, let alone have any say in who runs the country. Yet here we have it, someone trying to be one of the people, despite the fact in this city to be one of the people means spending a hour a day stuck in the A4, A4174, A370 or the M32 roads swearing about the incompetence of the car in front, or stuck on Gloucester or Whiteladies road complaining about bicycles and pedestrians. And to achieve this photoshoot, the pavement -our pavement- has been cleared of cars, the double yellow lines backed up by extra traffic cones and there are police around who are fining neither the politicians nor the protesters for using our parking area to walk around on. Indeed, one of the security or propaganda minions is actually walking on the road, which is normally a ticketable offence as far as we are concerned, certainly something which absolves us of any blame if they should end up under our bus. People still keep asking which politicial party Bristol Traffic, the city's premier car-centric news outlet will support. Well, nobody has made an offer which is compelling enough, by which we mean a carrier bag full of money in a currency we trust, that being US$, Euros with german artwork on the coins and Swiss francs. When we asked the UKIP for their advertising funding in Euros they weren't willing to oblige. Do they mistake us for idiots? Bribe us in Sterling? Don't be serious! It's good to see that the new St Michaels' Hospital barriers are working to keep pedestrians feeling second class citizens. However, we are shocked to see that someone has already bent one of the warning signs! Who would do a thing like that? We suspect a cyclist. 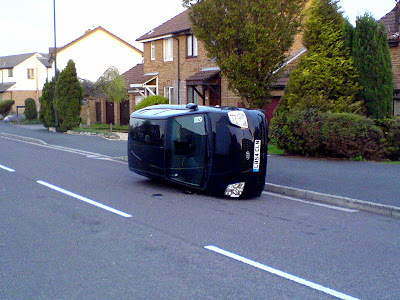 Who else would go down a pavement at speed, not looking where they are going. We are fortunate they hit this warning sign, and not a pedestrian, and that if they were injured there was at least a handy hospital alongside the car park. We watched to see if the cyclists would stop now there had been accidents, but no, we saw two in a row nip through the parking pavement to the right of the barrier, then pull in. Such actions are dangerous. Sadly, despite the best efforts of the NHS, not only is there still a gap for bicycles, some pedestrians are walking outside of the designated walking area! They may be wearing hi-viz and carrying a helmet, but this is no excuse for such dangerous activities. This (attached) is why we citizens of Cliftonwood voted against the CPZ. That kind of blunt one-size-fits-all approach wouldn't allow for the fact that somewhere like Ambra Vale is wide enough for perpendicular parking on one side of the road and double parking (like FL09NLN and K837XPJ) on the other and still has enough space for a bunch of layabouts - sorry, students - to sunbathe. One metric of how bad the recession is is what activities people have to get up to in order to feed themselves. Here in Montpelier, we can see that stripping bicycles of all resellable components is still a necessity for some of the residents or visitors. A lot of the cyclists think the red bit behind the lights, the ASL, is for them -the Advanced Stop Lane. They are misguided. If bicycles could get there, they would end up in the way of vehicles in a hurry. No the ASL, the Advanced Sprint Lane is either for vehicles stuck when the lights changed, or for anyone in a hurry, be they car, motorbike or bus. It is safer for cyclists to stay behind these vehicles, or get off the roads entirely. Here in Gloucester Road, the VW Golf KE51UWM has pulled into the ASL, ready to sprint forward the moments the lights change. Sadly, there was an equally agressive car coming up from the arches, so the whole goal of the operation -turn right onto Zetland Road without waiting- was not met. To pull these tricks off, you need a car with good acceleration, and you need good traction. That means either 4 wheel drive, or two wheels and wide tyres in good condition -and a good road surface. This is why the council-funded Sita street cleaning vehicle GN07UZA has pulled into the Stokes Croft ASL on a red light. By cleaning the road here they can keep it clear for cars in a hurry. They will also sweep up bits of broken glass, which should stop the cyclists complaining. Chris Hutt's funeral will be at Canford Crematorium, 1pm on Friday 30 April. This will be followed at 2pm by a wake at 35 King Street (ground floor) for tea/coffee, etc. Catering numbers are limited at the wake, but nonetheless please let Chris's son (Chris Jnr) know by email (bathroombuild at yahoo dot co dot uk) or text (07894 164038) in good time if you wish to attend either or both. Bristol Cycling Campaign are planning a memorial bike ride after the wake to celebrate Chris's life and achievements, taking in the Bristol-Bath railway path. The date also coincides with the monthly Critical Mass ride so we could look to join forces on this one. Please send me any suggestions you may have for a route, timing and suitable venue to end up at where we can raise a glass to Chris. Below we see Chris with Charlie Bolton, grabbing some food. Professional political parties bring their own edibles and alcohol to these events. Only the Green party would share theirs: even the LibDems told us it was our own fault for not planning ahead. There's probably a message there. Because Chris knew many of the councillor and politicians at the event, we ended up providing a bit of background info to the Guardian reporter who didn't know the city. If there is one regret here: failing to describe Clifton East as an edgy inner city estate where people were scared to walk the streets at night. Sometimes the truth is best kept secret. Bristol 24-7, who published a lovely obituary, would love people to take on this part of Chris's work this coming May: a couple of people in every counting station, with camera and laptop, would give the city the best election coverage it's ever had. Get in touch with them if you can help -it would be a great way of remembering Chris through deeds. BristleKRS has listed the local press and blog coverage. Chris also got a mention on Crap Cycling and Walking in Waltham Forest, which would have pleased him no-end, as the identity of the elusive Freewheeler was of great interest. Finally, for anyone wondering why Chris would have anything to do with a blatantly anti-cyclist organisation like Bristol Traffic, here is a secret. In exchange for technical support related to web browsers (details some other time) -he was our Clifton correspondent! You wouldn't expect us to go there ourselves -there's nowhere to park! The ongoing theft of a bit of Muller Road from cars continues. One side effect is that it forces National and Europcar van rentals to park their vans up on the pavement, else this stretch isn't wide enough for two lanes of traffic. Looking the other way, we can see that Siemens are busy fixing this new -and utterly unwarranted- crossing up, one which apparently has a detector for approaching bikes, and so schedules them with green. Some people may think that having the signalling van park BF07NYA so as to prevent bicycle access from the path onto the road is a sign of Institutionalised Motorism in the traffic planning world, one where only the safety and convenience of drivers and their passengers are considered, and that parking your van close to where your work is is more important than anything else. Those people -and having seen Crap Cycling and Walking in Waltham Forest we know who they are- are misguided. Out of sight behind the van, just past where the right turn is, a large lorry has been parked for a week. So what you say? Look at the back of it. Not only is the road-side corner bent, by its rear tyre is the remains of the body coloured bumper of a car that must have clipped it at speed, damaging the car and possibly injuring the passengers. Muller Road joins the M32; you can come off it having driven from London, Birmingham or other places at 70-80 mph the whole way. When you get into the city you are still slowly adjusting to urban features like red lights, speed limits and pedestrians and cyclists getting in the way. While Portsmouth is dealing with this by needlessly lowering the speed limits on the M275, we believe the correct approach in Bristol is to keep the speed limits high and roads just off the motorway clear of pedestrians, cycles -and parked cars. That way, you can slowly adjust to being in town, encountering one feature at a time. First red lights, then lower limits, finally the other clutter of anti-car city streets. Vehicles parking on Muller Road must park up on the pavement or behind the bike lane -not to prevent damage to their vehicles, but to help those drivers who are still driving "motorway style" to adjust slowly to the city streets. The driver who crashed into this car was probably just doing 40-50 late at night, expecting a fast empty journey home, then suddenly this white van with reflective bits appears out of nowhere, parked on the road. If it had not been for the trees preventing this vehicle from parking on the pavement, this collision could have been avoided. We sent one of our expendable cyclists out there to see whether the new anti-bicycle, anti-pedestrian features would stop cyclists trying to use the pavement on Southwell Street. We hoped so, because it would discourage them from trying to cycle to the University, taking up valuable space on our streets. Sadly, our experiments -on a Sunday- showed that it is still technically possible for a bicycle to do it. Of course, were it a weekday, when the main road option is blocked off, and the street full of pedestrians, attempts to cycle this way would create exactly the kind of bike/pedestrian conflict that we always complain to the Evening Post about as proof the cyclists are selfish criminals. The painted pedestrian bit on the road really is meaningless: vehicles know that it is a road, and anyone walking on it is a tax dodger without any insurance -and that they have chosen to die. There's no way to get a wheelchair back up on the pavement, what with the dropped kerb being blocked off. We don't care about the first of these, pedestrians should not be there. Disabled people? Interesting. In the video they carry on along the road, but remember, on a weekday, the barrier will prevent this. This raises some interesting questions about who owns the road. If the road belongs to the council and has been blocked by the hospital then the barriers are probably technically not-legal. This is a pity, as anyone who owns a driveway will be watching this case and hoping they can put barriers up on their bit of pavement, so that they can pull in more easily without worrying about passing schoolkids. If the road now belongs to the hospital, then it's just fallen foul of disabled access legislation and there's a risk that someone might grass them up to the DWP for falling foul of the Disability Discrimination Act. Either way, it amuses us. Our biggest fear is that the council will now take a look at this problem, explore which bits of pavement are theirs, and not only force open this road, but take away the parking on the other side. We get lots of visitors to this site using the keywords "BRI Parking", presumably because when you get an invite to visit the BRI, the leaflet on getting to the hospital includes no details on parking. Instead it covers how to get there by bus and train, the timetable for the free bus from the station, where the bus station is. What the leaflet doesn't cover is where any free parking for the hospital is. Unlike the suburban hospitals in the city, like Southmead and Frenchay, there are no half-empty residents streets nearby, not on a weekday, and the council and hospital both refuse to provide free parking for visitors. This is unacceptable. Many political groups in the city have asked us for our endorsement. So far, the UKIP transport policy appeals the most. We like their plans to raise speed limits on M-ways to realistic speeds, though think 80 mph isn't that realistic -haven't they done the M5 northbound run recently? 90 is more honest. We like their idea of introducing the turn-on-red rule, as it ensures that bicycles and pedestrians can't view a green light as a safe time to move. Walking and cycling are too dangerous in modern cities. We like their idea of making free parking in hospital parking areas possible, though they aren't as strongly behind it as the SNP are, so we doubt that the BRI will benefit. We like their proposal to remove all licensing issues on taxis other than roadworthiness, though we don't believe they have noted that taxis and minicabs have special MOT requirements: indicators and brake lights should be optional. 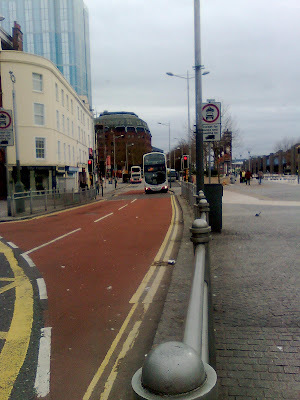 10.9 Local authorities should be given additional powers to enforce a ‘cyclists dismount’ or ‘no cycling’ regulation where there are safety concerns – such as on busy roundabouts, junctions or bus lanes, or where the road would be too narrowed by cycle lanes and cause unacceptable delays to traffic. 10.8 Cycling on safe cycle routes, lanes, tracks and trails should be actively encouraged, particularly as a leisure pursuit. This is so wrong! Leisure cycling still encourages people to ride a bicycle, out there, singing Edelweiss or whatever families do on bicycle rides. No, leisure cycling is a crime. Stamp it out. Fortunately, they do that on page 33 where they propose re-opening the Yatton - Cheddar line, stolen by the cyclists and called "the strawberry path". If there is one big flaw in their paper, they use metric measurements such as tonnes and metres as soon as page six. If they want to be free from EU interference, they should get rid of these EU counting systems and go back to yards, feet and lbs. Indeed, let's get rid of decimal values, go back to pounds, shilling and pence. Decimalisation is EU interference in our money! Only in Stokes Croft, our new bohemian art's area, would you find someone walking up the road -our road-tax funded road- carrying a large orange frog sculpture. Well, as anyone who has spent time in the area will know, it's usually better not to inquire what the other people are up to. Better just to sit in the corner of the road and drink quietly, before driving home. The Royal Mail is phasing out its bicycles, replacing with (presumably diesel) vans. Yes, this will screw up the post's 10:10 commitment to global warming, make pollution worse, and shows that the Royal Mail's spreadsheet shows a different cost model of future oil and fuel costs from the Peak Oil people. But it will mean: no more being stuck behind Posties who are trying to cycle up Cotham Brow with 20 Kg of mail, while you are in a hurrly. At least the students admit defeat and push their bikes up the pavement, some of these postmen -effectively professional cyclists- get in our way, and stay there, all the way up. What's worse, that's our tax money at work. Our petrol and road tax money. The best bit: rather than explain this away as the only way they can impose unrealistic schedules and weight loads on individual postmen and postwomen, the RM is saying they are doing this because cycling is too dangerous! We love this, it is one in the eye for cycling city, for Bristol's "have you tried cycling" signs up on the B4018 from Cribb's causeway to the Downs, for the "try cycling" propaganda the council pushes through our doors. If one of those council-funded pro-bicycle assistants turns up at our door, before we set the pit bulls on them, we will say "If cycling in Bristol is so good, how come it will be one of the first places in the country where the posties will have their bikes taken away?". Answer us that, eh? We know who loses: the residents. The average vehicle speed up this road is actually higher than for any other road in Montpelier (source: some of the 20mph documents), so when somebody clips your wing mirror, more risk of damage. Worse still, every week or so some HGV lorry ends up here as their satnav directs them to the Bristol St Andrews Road, not the dual carriageway with warehouses out at Avonmouth. Serious risk of damage. Nobody gains from these bollards, all they do is make the place look bleaker. At least get some decent paint or graffiti on them! The trouble with driveways is that they are rarely big enough to park your lorry. The driver of this vehicle G596JYC was forced to park on the pavement, here on Alcove road, between the Railway Path and Eastville Park. This shows inadequate forward planning when these houses were built. Yes, they were built in a time when cars and driving down Fishponds Road to the city centre was part of the vision of the future, but nobody had thought that the household's motor vehicle collection would comprise three cars, one caravan and a small truck. Down a stokes croft, a cyclist has stopped to talk to a pedestrian in a bike lane. That means not only will any moving cyclists get in the way of our cars, nobody can park in that bit of the lane to nip into any of the shops. Round the corner, there's a row of bicycles heading along Picton Street. How can anyone in a hurry get past all of them? Our reporter had to pull over and wait. This is proof that bicycles cause congestion -and make parking worse. Yet do they realise this? No, they sit there, smugly, thinking they are helping the city, rather than hindering it. A contribution from "dempster", along with some commentary. This is Broad Quay, where the council stole car, truck and even taxi access a few years back. Now it is for buses and cyclists. Our contributor raises a question about pedestrians. "These lights have intrigued me for a while, as I have stood waiting at them on my bike, and watched as the green man turns red and then back to green again, without the lights for vehicles changing at all. I assumed this was a piece of radical anti-cycling infrastructure, lights that only turn green for motor vehicles. But the other day I waited there at the same time as an ambulance, and we both ended up skipping the lights as they never changed. And then shortly after I took this photo, the bus in it skipped the lights. I don't think it waited long enough to work out that the lights would never turn green, presumably the driver knows this already. Although I'm sure I have seen it turn green for buses before. So my two remaining questions are: What is it that triggers the lights to go green for vehicles? and What's the point of having a phase of the lights where it is red for both pedestrians and vehicles? Why not just leave the pedestrian lights on the green man? I suppose the answer to the second question is that we don't want pedestrians to feel like they can just cross roads willy-nilly. They need to learn to wait." We think the reason is more subtle. Because the bus drivers know to ignore the signs, their sole purpose is to lure pedestrians out in front of buses. This reduces the number of pedestrians (good) and ensures that the bus schedules are always wrong (good). It also reinforces a fear of walking which helps the rest of the city's drivers. This is Ratcliffe Drive at 6am on a Sunday morning and it is the neatness of the new method of parking which is perhaps especially worthy of a mention. Apparently no-one heard or saw anything during the night (when, presumably, the "vertical parking" took place). It does appear to have damaged one of the wing mirrors, which is often one of the motivators for parking on-pavement. However, once that mirrors is off -and who needs them anyway- it will work quite well. You can get a full vehicle into the same space normally taken by half a car. If used in the inner city -we are thinking Montpelier- it would let people double park on both the pavement and the road, so double the entire parking capacity of the area. "You can't measure the mass of a particle without changing its velocity". Heisenberg said that. Early last century. 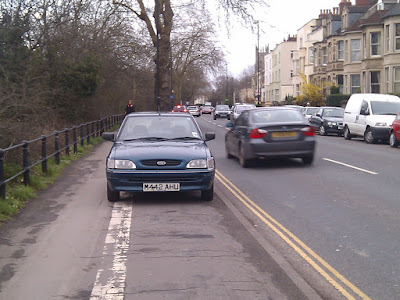 Here we see it on Arley Hill, the council traffic monitoring car WV09NYO, parking across a bike lane. Yes, its the only way to collect data by hand, but you have to realise: your very presence alters the data itself. Move to the 21st century: track the phones. 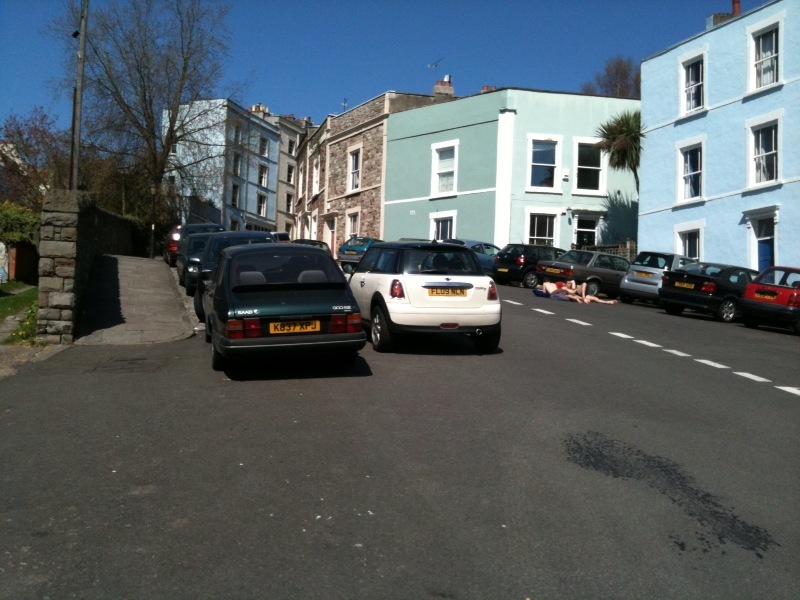 We love the sight of L-plated cars parking "Bristol style". If you want to drive in this city, you need to know how to park in it, and the first rule is knowing which signs you can ignore. Yellow stripes on the ground are a good starting point. Here. Robbies instruction car WR57FYY makes discreet use of the available space on West Park, between Whiteladies Road and Cotham Hill. Neither of these number plate strings appear in Google's datacentres at the time of writing, so we welcome them to the World Wide Web. Apologies for the camera strap in the way, some of our reporters are, well, incompetent. Incidentally, can we ask all web sites that put videos and photos of cars up to use the full registration number without any spaces. It's what the car dealers do, and helps keep things consistent. This means that you can search for KY08XHW and not only get quotes selling this car second hand with 11,000 miles on it, you can see our page noting this car was used for teaching people how to drive round Bristol, and therefore its clutch, gearbox and suspension are toast, regardless of the mileage. Same for KS08KK0: search engines work best with consistent identifiers. This is why the dealers and the Bristol Traffic project use single-word registration numbers, and we encourage others too: its the only way to integrate properly across the web. 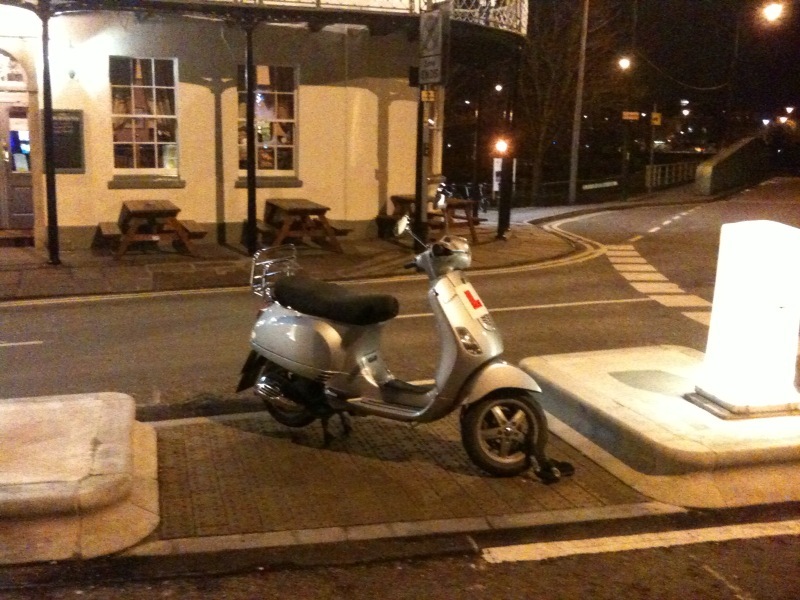 "E" sends us this pic of a scooter outside the Louisiana Pub. As they say, "Creative". What's good here is that you can be fairly confident no passing car is going to scrape you unless they go fully over the traffic island. If there is a problem: nowhere to lock the scooter to. One of those sheffield racks would help. Some people say they like Montpelier because of the community. We say: the community is odd, especially those walking around. First off: a brass band. On a Sunday night. We say: it's OK to have a hobby, but ideally something more discreet. Next off, a militant pedestrian rights activist and a small child. Never in the living streets manifesto do they say that the pavements are for people wearing fur coats from recycled 1970s carpets. while children run around dressed as if a trip to the streets is a mountaineering expedition. And what is a small child doing on the streets of Montpelier after dark anyway? Someone should call the council social services or something -about everyone seen on these streets. More news from our new contributor, flytopia. These pics also mark our first photos from a google nexus one phone, which also includes GPS location data in the images. Handy. A concerned citizen has noticed the danger posed by the roadwork signs on Coronation Road (i.e. a cyclist may fall into the road, blocking traffic). They have selflessly parked their car M442AHU on the cycle path, creating a far more visible deterrent to cycling.